Eastern America’s highest town, Beech Mountain NC is perched atop the Blue Ridge Mountains, a destination for all seasons. Winter is home to North Carolina’s premier ski resort, Ski Beech. Fall features amazing views and unique events like the Autumn at Oz festival that bring Wizard of Oz to life. Summer is an escape from the sweltering heat. Temperatures rarely exceed 73 degrees making outdoor Recreation a revitalizing experience. Beech Mountain Youth Sledding Hill: Located next to the Beech Mountain Visitor Center this fun and FREE winter adventure is offered to kids 12 and under from 1-5 PM weekdays and 9 AM - 5 PM weekends, weather permitting. Call (800) 468-5506 for current conditions. Newer vacation rental minutes to ski slopes - 3 bedrooms, 3 baths, sleeps 8. Mountain and valley views, 2 covered decks with gas grill, gas fireplace, terraced garden with fire ring, game room, WIFI. Romantic Mountain Getaway - 1 bedroom, 2 baths, sleeps 4. hot tub, 2 decks, swing, fireplace, gas grill, fully equipped kitchen. Peaceful wooded setting. Average $128 per night. The Pinnacle Inn - suites, or one and two bedroom condominiums - complete with full kitchens, cozy living rooms, fireplaces, cable TV, and telephone (some with washer/dryer). Facilities: indoor heated pool, 2 hot tubs, steam room, dry sauna, exercise room, recreation area with ping pong, pool table, electronic games, 2 tennis courts, miniature golf, shuffleboard, playground, meeting room. Buckeye Lake & Recreation Center This seven-acre lake at the base of the town is one of our most popular recreation areas, with fishing, hiking, bird watching and picnicking being favorite activities. Stocked with trout year-round! State fishing license is required. There are two tennis courts, a ball field, walking/jogging track, picnic pavilion, and tot lots currently in place. Year around special events are held. Beech Mountain Resort, Inc. opened in 1967, Ski Beech is Eastern America's highest ski resort at 5506 feet above sea level. Alpine skiing and snowboarding will appeal to the thrill-seekers and for those looking for something a little tamer, the resort also features ice skating. Snow making is on 100% of the skiing terrain and there is night skiing. Snow tubing is also a recent addition. To round out your fun-filled day, spend some time in one of the charming shops or tempting restaurants. Genesis Wildlife Sanctuary and Educational Center - This unique non-profit wildlife center is devoted to the rehabilitation and release of wildlife on Beech Mountain and throughout the area. Sanctuary staff also conducts numerous educational programs and the center is open to the public. They conduct a summer day camp for youngsters. Dozens of live animals are on display, including birds of prey and mammals. Genesis is the home to Harley, the official North Carolina Ground Hog. Admission is free; pre-registration for visits is suggested. Beech Mountain Trails - The town maintains more than 20 miles of hiking and biking trails varying from easy to strenuous for all ages and abilities. There is also a paved, handicap-accessible trail around Lake Coffey. Guided hikes are offered from March through October for fun and educational experiences. 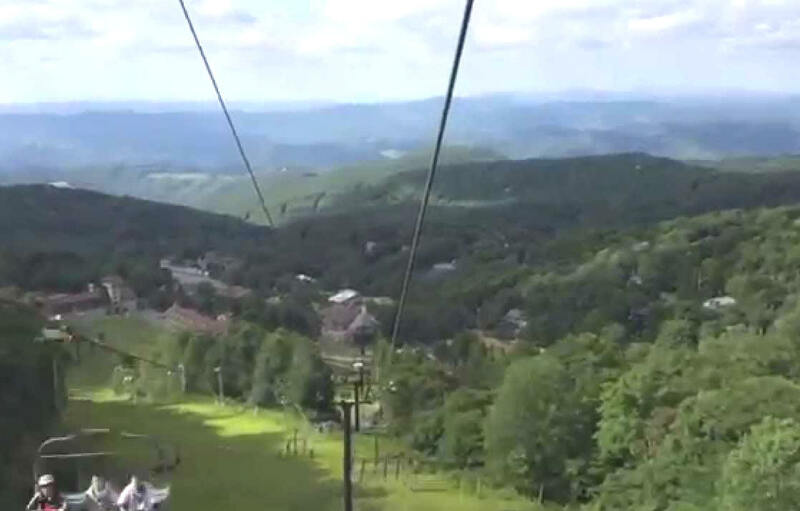 The Beech Mountain Adventure Trail Park opened in May of 2012 with 8+ miles of trails ranging in elevation from 4,700 - 5,400 feet.The park holds the distinction of being among the highest such venues on the East Coast. The Park offers single track, double track and gravel trails, all accessible from a trail head in town. There are future plans to expand the Park to 25 miles of trails.